Arrow concentrates on recruiting a successor to the Black Canary mantle as Felicity opens a door into a past that she thought had been put behind her. Laurel’s final words to Oliver were a request to make sure that the Black Canary legacy lives on. In this show it is very much a name that is passed from person to person starting with Sara so it makes sense that Laurel would want to preserve that because she’s very proud of what that name means. Oliver hasn’t done anything to honour that promise because he feels that it’s an insult to Laurel’s memory but he fails to understand that even though she was the Black Canary; the Black Canary doesn’t have to be her. It didn’t start with her so doesn’t have to end with her. Oliver spends the first part of the episode coming to terms with that idea. The team have been searching for a list of viable candidates to take on the identity but Oliver doesn’t accept any of them because they aren’t Laurel. It’s a personal hang up of his and Rory calls him out on it in a really mature and reasoned way. This does change when Tina (Juliana Harkavy) is found because Oliver is impressed with her hand to hand skills along with the sonic scream ability. She seems perfect for the role but almost too perfect. 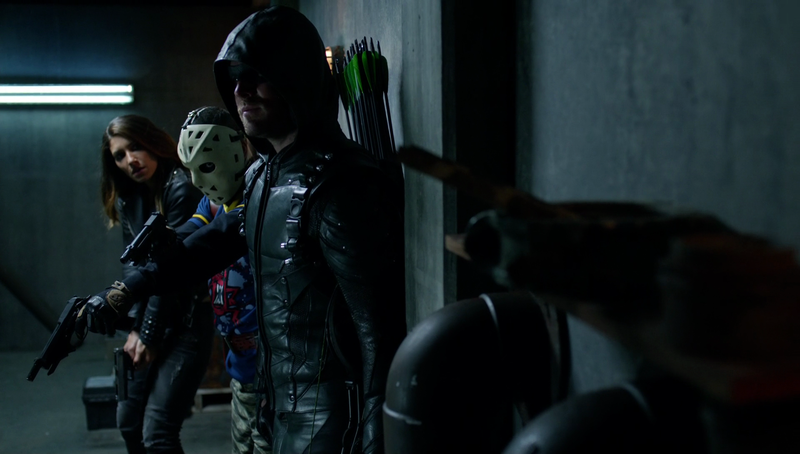 Putting aside the dramatic convenience that comes from a skilled fighter with a built in Canary Cry suddenly appearing just when Oliver is looking for a new Black Canary; the prospect seems too good to be true because things rarely go that well for Team Arrow. It is pointed out in this very episode that they aren’t used to good news so they are right to be cautious about Tina when they find out about her. It turns out that Tina is on a revenge mission against the man who killer her partner/lover the night of the Particle Accelerator explosion that gave her powers. It’s a simple motivation that feeds very well into the themes that this show often explores and it gives Tina something to work with as an introduction story. Oliver has been there so is able to speak from experience that revenge doesn’t bring the kind of closure that people want and few people know better than him how difficult it is to crawl out of darkness. Tina is in a very dark place when he meets her and Oliver sees himself from 5 years ago in her. The flashbacks aid this with Lexa Doig’s Talia al Ghul acting as something of a mentor for Oliver when he needs it the most. At that point in his exile he completely lacks direction and Talia recognises that something needs to be done about it. It feels like a meta commentary on the past two and a half seasons where Oliver hasn’t really built towards the Hood identity since leaving the island. It’s something that needed to be addressed and I didn’t think it ever would be so colour me impressed. Talia’s main lesson is that he should channel his darkness into something productive so that he can still function as a human being. 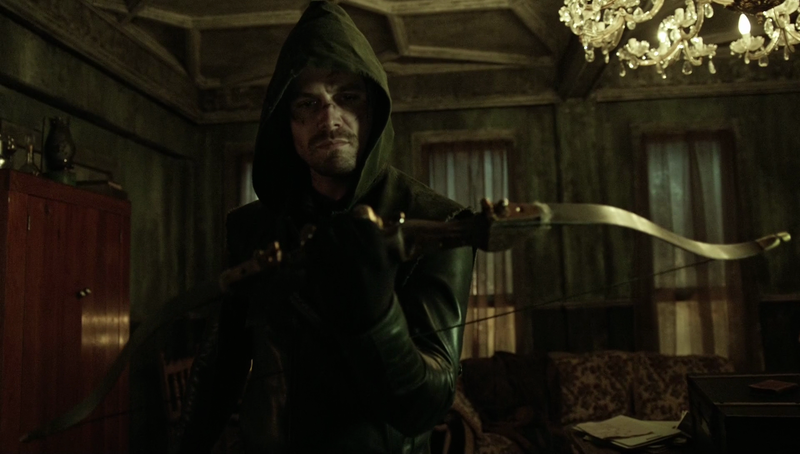 Oliver regaining his humanity was a recurring theme over the early seasons and still resonates now so it’s interesting to see that the Hood identity was something that Talia helped him create as a representation of his darker side that can be separated from Oliver Queen as a person. It looks like Oliver ending back up on the island will be part of a deeper fiction that he creates involving his identity as the Hood. He needs society to believe that he has been on the island the entire time so makes sure that he is rescued from there. It makes sense and helps to legitimise him not being stranded on the island since the end of season 2. Talia is a good character so far though we don’t learn an awful lot about her at this point. She is someone who offers support and advice but very little else. This works for this episode because she is a mystery to Oliver that may slowly be solved as he learns more about her. I imagine he won’t learn that she is Ra’s Al Ghul’s daughter in the flashbacks but I’d be shocked if she doesn’t appear in the present day at some point. Oliver’s lessons in the flashbacks connect to Tina’s arc in a really intimate way. Without them it might seem that Oliver is being judgemental because he thinks he knows better but we see that he has been through what she is experiencing and definitely does know better. Seeing that play out helps his words to resonate more clearly. He is able to help her come to the realisation that her darkness can be channelled through the Black Canary persona. Tina’s arc is handled in a really fascinating way as well. She is on her revenge mission and is singularly focused on that so never has that moment where she hears Oliver’s words and changes her ways after understanding what he is saying. She learns the hard way that he is telling the truth when she kills her target and doesn’t find the inner peace that she assumed she would get from avenging her partner/lover. I was impressed that the writers let Tina learn this lesson the hard way as it gives her flaws that can be worked on in the coming episodes. 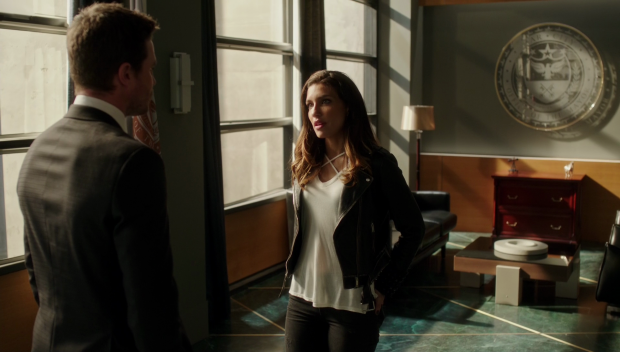 Outside of her arc, Tina is a really good character and Juliana Harkavy plays her well. 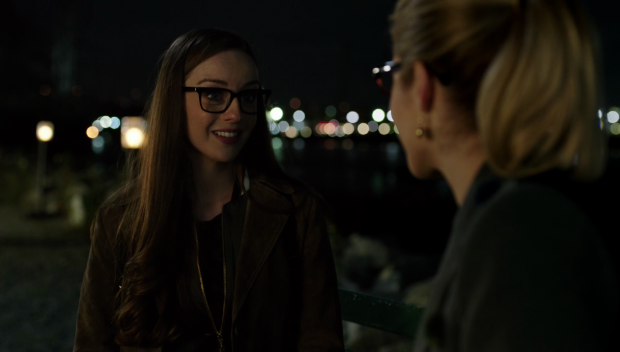 She has great chemistry with Stephen Amell and feels like a natural fit for Team Arrow as it currently exists. This is further proof that there is room in the street level heroics for metahumans, magic and the other craziness that comic books can offer. I look forward to seeing more of her. I’ll be referring to her as Dinah from now on since her real name is Dinah Drake. Tina was used in this review because she was known by that name for almost the entire episode. Oliver’s arc in the present day this season has been about overcoming his shortcomings as a leader. The new team have allowed him to learn the leadership skills that he was previously lacking. These didn’t develop because the previous version of the team had personal baggage for him with Thea being his sister, Laurel being his ex girlfriend and Diggle being his best friend but the new team aren’t people he was close to before that so he has the necessary distance as well as the experience to mentor them. Earlier in the season he had unrealistic expectations of them and assumed they would follow orders because he was in charge. Slowly he learned that trust needs to be earned and since he has been more honest with them the dynamic has shifted to something more cooperative. In this very episode he trusts Rene to deal with the new threat while he goes after Tina. He has gotten to the point where he is giving people the opportunity to prove themselves and Rene rises to the challenge as a result. Of course Evelyn marks a really significant failure but he can learn from that and Tina can be a success because of what he has learned. The team are really coming together as a cohesive unit. I’ve already mentioned how Rene is handled in this episode and I like that he pointed out how grateful he was for the opportunity to have a second chance. We know that he was dishonourably discharged from the military so for him this is an opportunity to make up for his mistakes. Curtis is finding a way to be useful as well and maybe his redemption will come when he reunites with his husband. Rory is also keen to do his part and honour the people lost when Havenrock was destroyed. He also challenges Oliver in really reasonable ways. It’s great to see these characters finally given a place in the show that feels right for them and there’s plenty of room to build from here. Felicity also takes some cues from her past to help inform her future. Trying to find information to clear Diggle’s name by gaining leverage on the General gunning for him gives her a solid hacking subplot to sink her teeth into. It goes in a direction I didn’t expect when help comes from a random source who became a hacker because of her. Back in the day Felicity was very anti establishment but moved away from that after the events of “The Secret Origin of Felicity Smoak”. The perception on the darkweb is that she went corporate as she was the CEO of Palmertech for a while. Even her role on Team Arrow has a status quo preserving edge to it so forcing Felicity to consider her place in the world is a surprisingly strong story for her. For one thing it’s great that it doesn’t involve a man in any way -outside of Rory backing her up- and for another it’s a genuine mystery as to which way this will go. She’s clearly interested in reawakening some old habits but it’s unclear what that will look like in the coming episodes. This story also resolves Diggle being in prison but it doesn’t resolve it in a way that’s interesting. Some legal jargon happened off screen and now he’s a free man but there’s no real drama there. Diggle should have more agency within this plot and proving his innocence should be something he has a direct impact on. Maybe there’s more of this to come but for now it wasn’t well handled. It recently occurred to me that this plot could have been solved by asking the President of the United States to pardon him after he helped save the world from an alien invasion. I wonder why that hasn’t been brought up as an option. 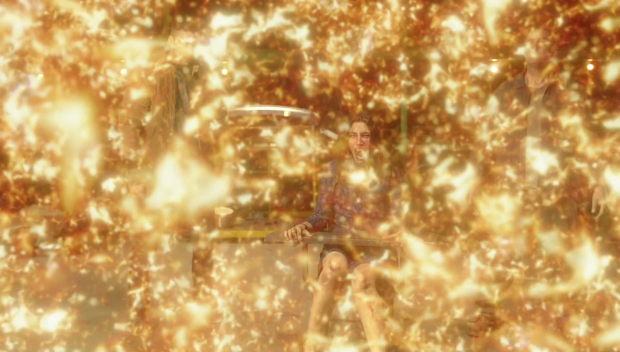 There was nowhere that this would fit organically into the body of the review but I have to mention that I was very impressed with the brief Flash cameo. He was nothing more than a special effect but it’s a clever way to remind us that this universe is a big one and that Barry always has time to help out. An excellent episode that introduces a compelling new character and connects her to Oliver because of their shared darkness. The flashbacks involving Talia help flesh out Oliver’s position on channelling darkness in positive ways and stops his advice from seeming preachy. Tina is allowed to learn the lesson the hard way by experiencing the empty feeling that comes from a revenge kill for herself. She will be a good addition to the team based on her experience here. This also ties into Oliver’s growth as a leader shown by him trusting the team with more and changing his approach to be a more understanding mentor. As such the team feel like they all have natural positions. Felicity revisiting her past and reconsidering her role from the ground up is a surprising compelling story that thankfully doesn’t involve a man. It’s a complete mystery where this will go but so far it’s a good place for the character to be in and offers some really fascinating possibilities for her in the coming episode. Unfortunately Diggle being found innocent has no real impact because most of it happens off screen when he should have had a major role in proving his own innocence.